American Moms who fought adversity, gave tirelessly, and shaped the world around them. As Mother’s Day approaches, we’re reminded of the women in our lives who have influenced and inspired us. However, It’s also a great time to look back a little further, at the mothers who have helped to shape our history and culture. Researching my new book American Mom, I discovered mothers who nursed dying soldiers, organized labor protests, sacrificed for their art, and fought against prejudice—all while caring for their kids and wearing some pretty uncomfortable clothing. Here are just a few inspirational mothers who’ll remind you of the enduring strength and resilience of the American mom. Irish immigrant “Mother Jones” had a difficult life. In 1867, the schoolteacher and dressmaker lost her husband and four young children to yellow fever. In an attempt to rebuild her life, she moved to Chicago and opened a dress shop—which promptly burned to the ground in the Great Chicago Fire of 1871. Instead of crumbling to pieces, she began organizing union strikes and fighting against child labor. Jones was sentenced to prison several times, and was denounced on the floor of the US Senate as the “grandmother of all agitators.” Her response: “I hope to live long enough to be the great-grandmother of all agitators.” You don’t get much more determined than that. In the 1850s, Ann Reeves Jarvis organized Mother’s Day Work Clubs to combat unsanitary conditions in West Virginia, teaching moms the importance of boiling water and protecting milk and food from spoilage. Sadly, Jarvis lost many of her own children to childhood diseases common in Appalachia, which inspired her to help others. When the Civil War began, she and her fellow moms fed and clothed both Union and Confederate soldiers, remaining neutral to help all in need. When she died, her daughter, Anna Marie, campaigned to have Mother’s Day recognized as a national holiday in Jarvis’s honor—so you can thank her for the one day each year you (maybe) get to sleep in. When Harlem Renaissance poet Georgia Douglas Johnson moved to Washington, DC, with her politician husband, he expected her to be a traditional wife and mother. Instead she went on to publish four books of poetry and host now-legendary Saturday night salons in her home, attended by such luminaries as Langston Hughes, Jean Toomer, Zora Neale Hurston, Alain Locke, Jessie Redmon Fauset, and more. In 1925, Johnson’s husband died, leaving her to raise her two teenage sons on her own. She worked tirelessly and managed to put both boys through college—while never giving up on her poetry and her dreams. 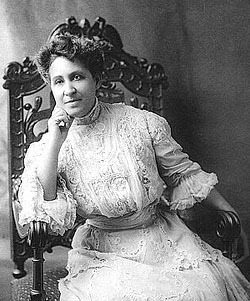 Born in 1863 in Memphis, Tennessee, to former slaves, Mary Church Terrell was a founding member of the National Association for the Advancement of Colored People (NAACP) and one of the first African American women to earn a college degree. She and her husband had three children who died in infancy, and a surviving and an adopted daughter. Terrell worked with Frederick Douglass on civil rights campaigns, served as president of the National Association of Colored Women, was active in the women’s suffrage movement, and was the first black woman appointed to the District of Columbia Board of Education. So, the next time you want to make a difference, but the latest deadline or toddler tantrum has you down, remember the moms who rallied, organized, and followed their passion—without the benefit of yoga pants or social media. Because there’s no greater force than a mother determined to change the world. For more amazing moms who’ve inspired America over the decades, check out the new book, American Mom: A Celebration of Motherhood in Pop Culture! Meredith Hale is a published author, blogger, and mother of two. Her newest book is AMERICAN MOM: A Celebration of Motherhood in Pop Culture (Sterling 2018). You can find her at Mommy A to Z (http://www.MommyAtoZ.com). Make room for your mom to be her perfect self.